Rhode Island Gov. Gina Raimondo is asking the state legislature to expand a program that pays students’ college tuition. The program, Rhode Island Promise, currently pays for two years of tuition and fees at the Community College of Rhode Island. Raimondo wants to expand that program to cover two years of in-state tuition at Rhode Island College. 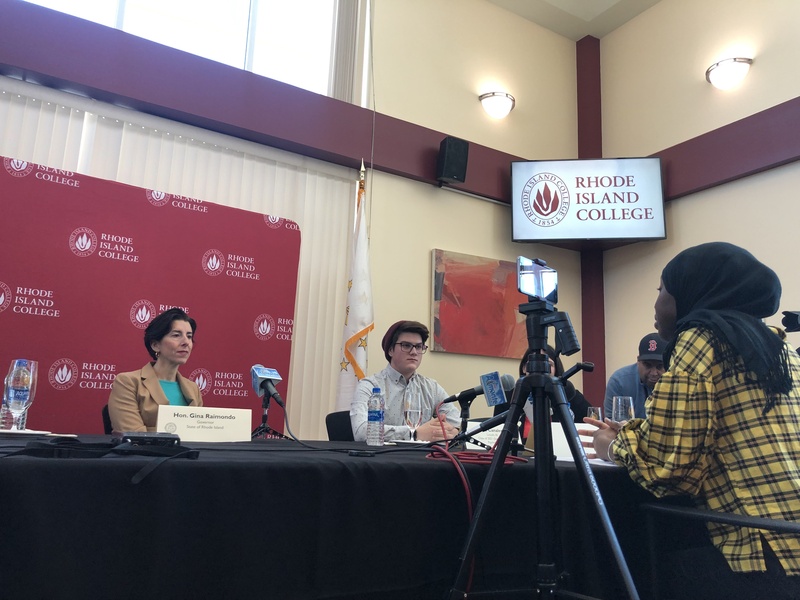 To promote her proposal, Raimondo held a discussion Thursday at RIC with students who said they have trouble keeping up with the costs of college. Adesubomi Shitu is a sophomore studying public health at RIC. She said she’s worked two jobs to cover tuition, textbooks and other costs. She supports the governor’s proposal, saying young people today need a college degree to get a job that pays well. Raimondo argued that paying students' tuition will help more graduate and find higher-paying jobs. That, she said, will help the state's economy over the long-term. The governor will speak at a House hearing Tuesday to argue for her plan. Gov. Gina Raimondo listens to a student during a discussion at Rhode Island College. The governor is pushing for an expansion of a program that pays college students' tuition.